The first years of life bring about major developmental changes in children’s lives. Among the most significant of these changes is children’s entry into formal language. Besides setting the stage for later school achievement, having skills in the understanding and expression of language allows children to interact with people around them and to participate in their culture. Parents and family members are critical in supporting children’s early language and communicative development. 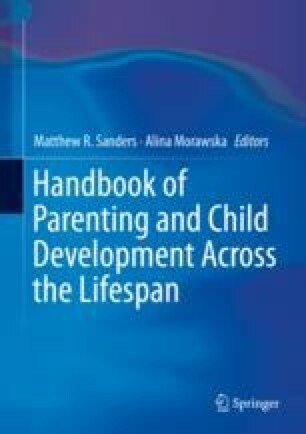 This chapter describes how parents influence their children’s early communicative and cognitive development. We cover current theory outlining how parents shape young children’s development in the first years of life, provide a summary of the descriptive research on the influence of parents on children’s language and communication, and discuss this literature’s strengths and weaknesses. In addition, we provide examples of interventions that have been implemented for strengthening parents’ skills in promoting children’s language. Finally, the chapter outlines needed research in this area and describes the implications for policy and practice based on current research.